What sort of strange custom would there be on your mission field that people might enjoy hearing about? 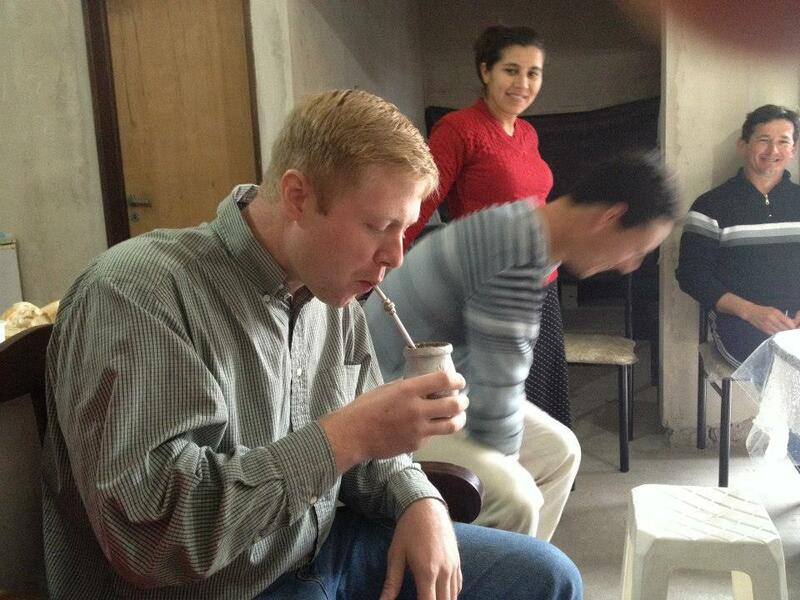 One custom that Argentina has that is prevalent throughout the country is the drinking of Mate. Mate is produced from the dry leaves of the Yerba Mate plant which is a plant classified in the Holly family. The dried leaves are then chopped and ground into a powder. Mate is drunk with a metal straw called a bombilla. Traditionally the straw was made of silver, no days most are nickel silver or stainless steal. The bombilla has a strainer on the end to filter out the tea. It is drunk out of a cup or a gourd. It is mainly drunk in social settings with family or with friends. I have drunken it before church with church people, going down a road in a car, and at a home of a friend. When being served one person in the group will assume the position of a server. They will first place the bombilla in the cup, then proceed to fill the cup with mate. It will be filled almost to the brim then hot water will be added. The server will drink the first brew of mate. In some places it is considered rude for him to pass the first cup to someone else because the mate may be too hot or too bitter. After drinking the first brew the server refills the cup and hands it to the next person. The cup will make its way around the group each time being refilled by the server. By the way you will be drinking after everyone in the room. “Don’t touch that straw!” Keep your hands off of the bombilla. It it is considered rude for anyone to touch the bombilla except the server. I found this story on wikipedia which I thought it was interesting. It is a story concerning the legendary origins of mate. “The Guaraní people started drinking mate in a region that currently includes Paraguay, southern Brazil, southeastern Bolivia, northeastern Argentina and Uruguay. The Guaraní have a legend that says the Goddesses of the Moon and the Cloud came to the Earth one day to visit it, but they instead found a yaguareté (Jaguar) that was going to attack them. An old man saved them, and, in compensation, the goddesses gave the old man a new kind of plant, from which he could prepare a “drink of friendship”. This post is part 10 in the series “Answering Vision” and is taken from the panel discussion questions from the missions conference at Vision Baptist Church in Alpharetta GA. You can read the last post in this series here.